I’ve done a horrible job of keeping up with other people’s blogs. The past 3-4 years was due to work. Now that I have free time again, I’m playing a lot of catch up with my hobbies. I tend to focus my efforts on writing my own blog, or toying around with my movie reviews or taking small steps to get my YouTube gaming channel ready for launch & streaming at nights. Too many hobbies, not enough time. Of course the wife wants to do things during the summer so my weekends tend to be full of stuff as well. It is something I want to get back into, as I’m pretty sure (based on engagement I’ve seen) my blog readership is greatly suffering by not interacting back. Still, despite my set backs, I did become aware of the great bucket list post that Billy of Cardboard History fame created, and I wanted to give it a go with some very long term, but generally obtainable goals. #1 – Secretive business idea. Okay, tough start for the blogging side of things, but this first one I can’t talk about. It’s listed at number one because it’s the biggest one for me to accomplish and something I think about constantly. It needs other people that I’ve talked with to play key roles, and maybe it could possibly happen if the stars align. If that all falls through, then maybe I’ll talk more openly about it to find the right people in other places, because I can’t do this alone. This may sound strange, but I don’t expect to finish collecting what I collect. Currently I collect 30 players and 1 manager. 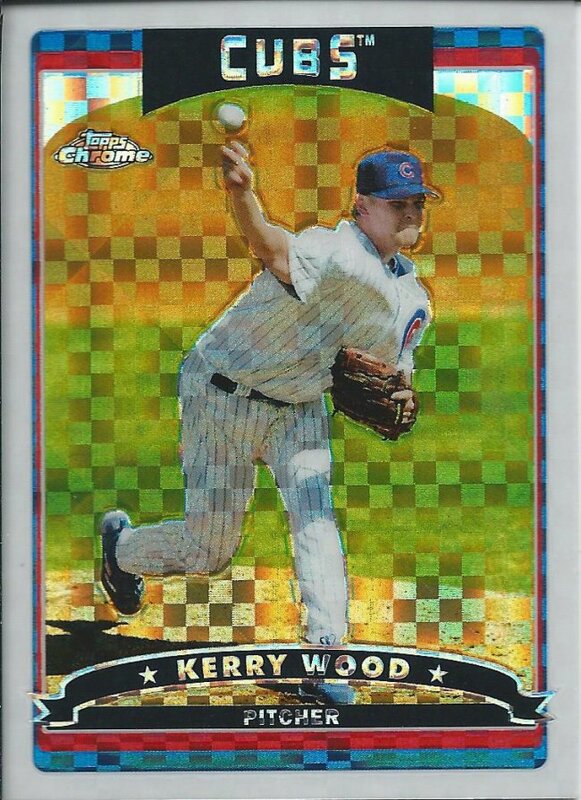 If the Cubs win another World Series, I’ll collect those guys too. But, even if I stuck with my original six, I know that 100% completion is not attainable. Even if I were to win the Powerball lottery, a huge obstacle is finding the cards that I need, and even if I was rich, I wouldn’t want to overpay just because I could. 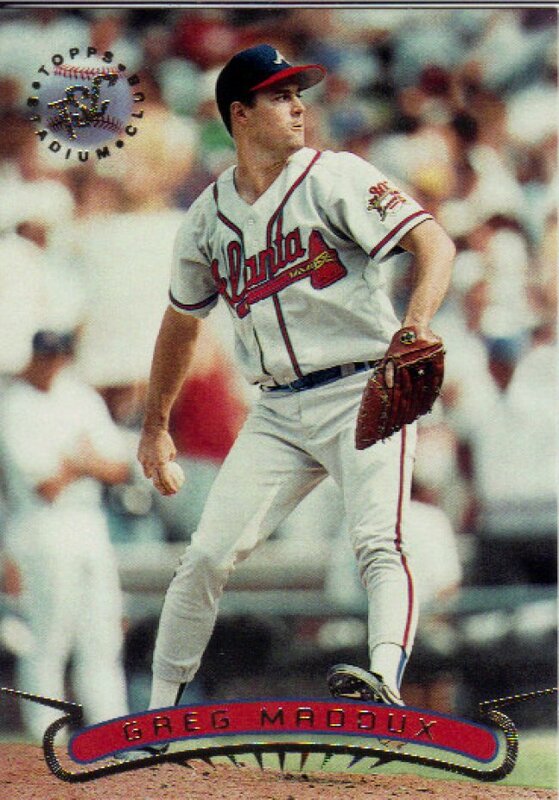 So, even with the restriction of nothing with a print run under 50, I will never have 100% of the Greg Maddux cards I’m chasing. However, there are enough people with low prices and a low number of cards to chase, that getting 5 of them done is possible. 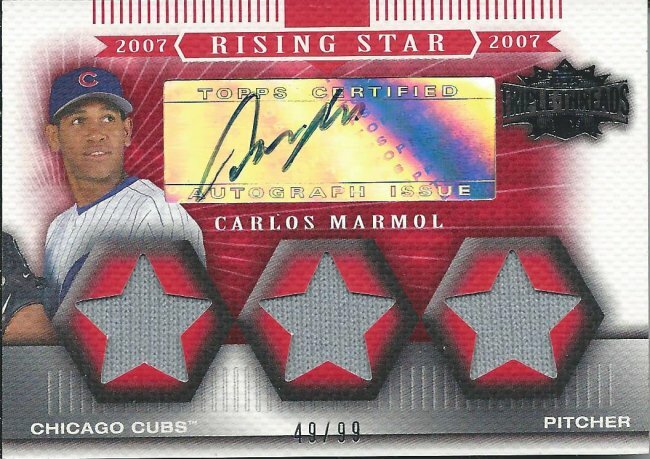 I’m 75% done with Carlos Marmol after all. In the same line of thinking, I do think that 50% is attainable for most of my collections, so that’s a good goal to shoot for. Of course, I wouldn’t stop after hitting 50% on anyone, but I’ll be quite satisfied to get to that level. This was my first real collecting goal 20+ years ago when I started it. I’ve made little progress since my return, but that’s largely because it’s tough to devote time at a card show or shop looking through basketball bins for one or two cards I might need. The selling sites don’t have these for as cheap as I want, so progress is slow. One day, I hope. I’ve waited over two decades, so I can wait longer. My want list has what I need if you care to try to help. This is tough to do among the blogging community, and I’m too anti-social to branch out further. I think I’m the only one trying to collect these sets that started in 2010. I want them all, and have finished few. I do have doubles, so if you want any, let’s trade. 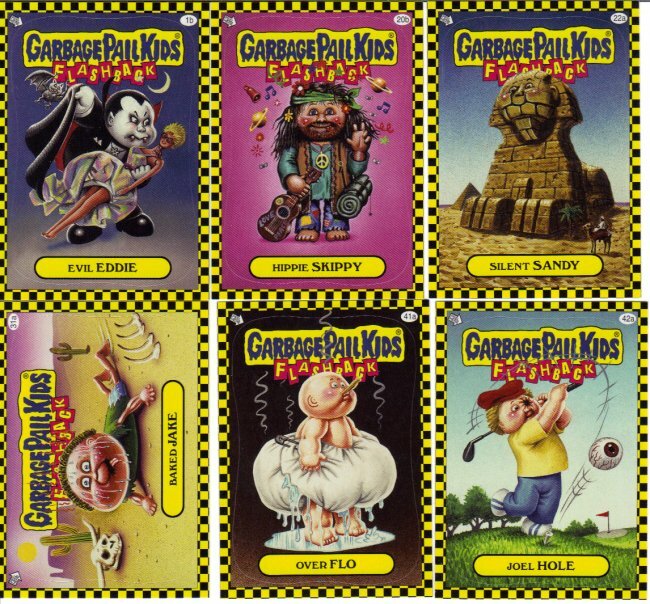 If you bought a couple packs and have stuff I need, I’ll trade baseball for GPK any day. Here’s the link to show what I need and have to trade. I need more trades like this! This only applies to the ones from 2011 and beyond. I had a lot of luck the first couple years with trading for what I needed, but no one seems to want to take me up on that anymore. Here’s the link again, because why not. Help me with this set! I’m not really a set collector, but there are a couple budget oriented sets that have really captured my interest. The big one is the 2011-12 Past & Present Basketball set, and despite buying a case of the stuff, I’m missing quite a lot of inserts. I’m also considering going for the follow-up year as well. On the baseball side, I’m going for both years of Topps Bunt (I have the 2016 base set, but don’t have a want list published for the inserts yet. 2017, I haven’t put together everything, but probably need a few base cards and a lot of inserts), and I’m also going to go for the 2018 Big League set with inserts. I’m currently behind on this by over a thousand or more if I had to guess. Holding off on buying stuff in large batches will make this possible. Posting more regularly will make this possible. Grouping cards together for some of the collections will make this possible. I still plan to individually separate every card for the original six whenever possible, but for the 2016 team, I can do multi-card scans. I know that you guys don’t care which way I go with it. It’s all for my own sense of satisfaction. I’ve accumulated a lot of stuff I don’t collect. It’s time to find new homes for it all, whether that’s through sales or trades or whatever. 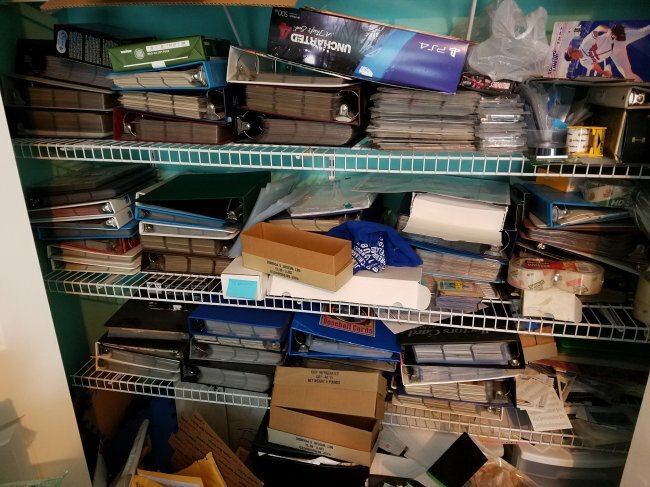 I want to get more active on all fronts to de-clutter the card room. I’ll be 40 years old in a couple years, and unless there’s some weird miracle I’m not going to have a child to pass this stuff along to. So, to make things easier on the person that will ultimately take care of my possessions, I want to start paring down now, because I know it will be a long, long process that is very long and very much a process. It’s best to do that while I still have energy and have some connections to people that might want the stuff. There we have it. Boy, it sure ended on a little bit of a downer, but I swear it’s meant to be a positive. Thanks to Billy for spurring the topic (I still have to look through my basketball cards again to help you with your want lists). I hope I can start being more active on your blog (and others) soon! I’ll end with an obligatory trade bait link. If you want to help with these goals, here’s a small fraction of what I have available. Great post! I hope you can pull these off. 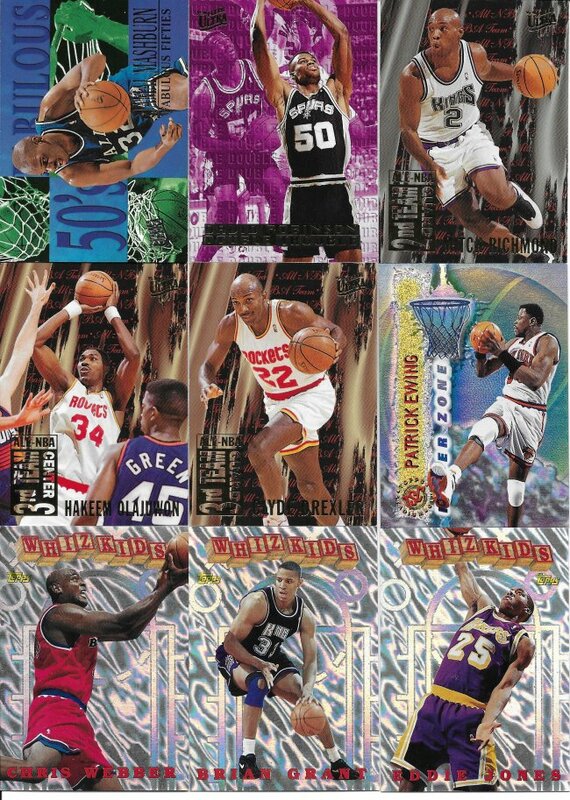 I don’t have any of the 1995-96 inserts off what I have available, but hopefully in the not too distant future I will go through my boxes of duplicates in my storage unit, which have mostly been untouched since 2013…might have some in there. It’ll be a while though because I don’t plan to go through them until I finish scanning everything, which is still a couple of years away. I also have about half the 2012-13 Past & Present base set if you decide to take them on, I really enjoyed that set…but the colation was terrible. I ended up with 4 of 5 copies of some cards and yet none of others, and I’m still trying to complete the base set. 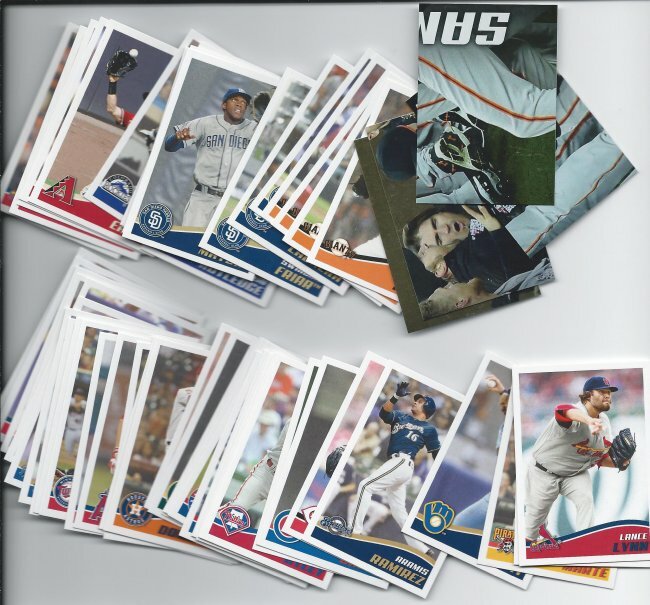 I am hoping to get some cards out to you soon, and I appreciate what you have sent me already, but if you come across other Indians cards when you are purging your non collection cards, keep me in mind.